Happy Thursday everyone! Isla Rose is on the move and my back has been killing me lately chasing her around and lifting her up and down all day. We escaped to the pool for the last two days straight so we can splash and float around (weightless) it’s been so nice and Isla is such a little fishy she LOVES the water. Here’s my pool day look I wore yesterday, and how darling is Isla’s one piece?! The back of it is my favorite!!!! I am loving the red and blue combo!! Such a classic look! Such a perfect summer look..and how cute is Isla!!!! Oh my gosh this is SO cute! LOVE that you two match! You look beautiful, Rach, and I adore how your cover-up matches Isla’s suit! Love this poolside dress!! I love how you and Isla are matching! Really cute! Love the blue/white with the red and I’m drooling over that tote. And Isla Rose is stinkin’ cute in that suit! Darling! Gorgeous dress! Love the semi-matchy factor between you and your cutie! Isla is getting so big! Look at those teeth, awww. Doesn’t time just fly when you have a little one? I love that coverup! Very cute! This dress is so chic and sweet! isla looks just adorable and a handful! Lovely post! I love how you two match! Her suit is adorable and I’m swooning over your cover-up. Loving the matching stripes! So cute. If a successful STYLE Look is all in the details, then you’ve mastered it Rach. So INFATUATED with the vibrant red TB sandals, your floppy hat and over-sized SUNNIES. What else is there to say but this look makes this Fashion Accessories Blogger/Store Owner very HAPPY. Beautiful pics and Isla is the cutest! I just found out I’m 5 weeks pregnant!!! We are so excited since this is our first, looking at your pics def gives me inspo, would you be able to do a post about what you do to prevent stretch marks and what your baby bump routine is? Thank you ? Hi Crytal!! I didn’t get any with Isla! I have heard stretch marks are more of a genetic thing and I moisturize my body every night with the Kiehl’s Creme de Corpse! I love it so much! You look so fab, Rach! I love the floppy hat, sunnies, and red lip, incredibly chic! I, of course, love your dress, too! Isla is growing so fast! She look adorable in her little bathing suit, I love the back of it, too! Thanks so much for sharing, beautiful! I love that you and little Isla match! Very cute. You also look so comfy for being pregnant at the pool! Isla looks so so CUTE! You look like a movie star! Loving the hat, dark sunglasses, red lipstick on you! Gorgeous!! I love how your coverup matches her swimsuit. She is so cute. I absolutely love putting my little girl in swimsuits because they have so many cute options. :)You look so pretty as well. I love your bump. I just had my little guy about 6 weeks ago and I already miss being pregnant. Rachel, you look stunning and I just love the fact that you and little Miss Isla are matching! You are such an inspiration! Isla is such a doll, that smile is precious!! You both look beautiful! How adorable! Love both of your looks :) Thanks for sharing the details. So adorable. I love the matching looks! Thank you so much Rochelle!!! I love your Sam Edelman lace ups in your most recent post! So cute!! I love how you and Isla are matching, your two look adorable! Oh my gosh Isla is the sweetest! I can’t get over how cute that little swimsuit it and I love how your dress matched hers! You both look perfect in your seersucker! I feel your pain, hang in there! 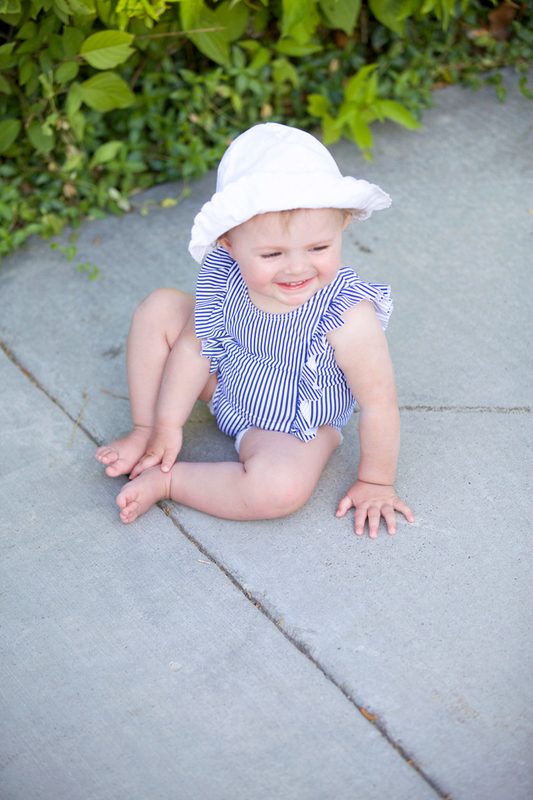 You two are adorable : ) I love Isla’s ruffles and stripes, as well as her beautiful smile. You look gorgeous! Love the dress and Isla is super adorbs!! I have everything but the dress, woot woot! The dress looks adorable with the bump and the sandals pop of color is a great contrast to the stripes on you and Isla, happy weekend’s eve! she is the cutest! and love that bikini whenever you wear it! Love your sandals! Lovely shade of red! I love your cool oversized bag! Hi Pia!! Thanks so much! It really is a perfect size to have as a summer tote too!! I love that you two are twinning! So adorable! You and your daughter are just beautiful! Hi Mary!! Thanks so much, I was so excited to find a matching dress to her swimsuit! SO cute!! I love all your photos!! Isla is growing so fast! You posted a picture with the black bathing suit on insta and I love it! Mind sharing where it’s from? I LOVE Isla’s swimsuit! That is adorable! What a cutie! This is probably the classiest take on a Mommy and Me outfit I’ve ever seen! It’s so sweet subtle and feminine rather than being over the top. And I totally agree about Isla’s swimsuit! it’s so cute!! Isla is so beautiful and so sweet! Your daughter’s swimsuit is adorable! Love how you two are matching as well! Hi Maggie! Thank you so much, I couldn’t resist getting it for her!! Im due in September Leah!! I love that your cover and her suit look like they match. So adorable! That coverup is so cute! I need to get one!! I adore your shoes ! love that you match your little girl! too cute!